When I go to the store and I am walking past hundreds of items there is bound to be something I see that I want. Ok, maybe a few items I see that I really want. "Oh, but I am on a budget!" I say to myself. I am sure we all face this scenario all the time. How do resist that urge to buy items we want when we are at the store to buy items we need? Sure we like an occasional splurge, and pamper ourselves with something that we have been wanting forever. And honestly there is nothing wrong with that as long as we don't do it every time we go to the store. I guess this is not only going to apply to going grocery shopping. Shopping online is a big way to make some bad dents in your budget. I am all for saving money, and shopping online you can save tons of money on clothes and household items. But there is a point that you can hit where you start buying just because it is on sale. This is a big no no! 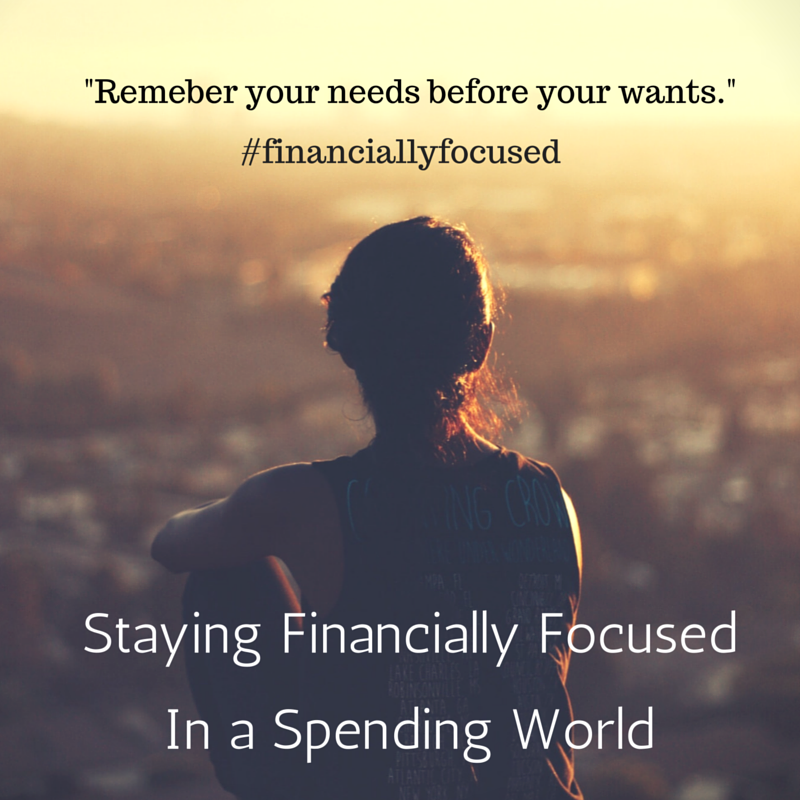 So, the big question here is, how do we stay financially focused in a world that seems too focused on spending money? To answer that we are going to go over a few things. First off, make sure you have a budget. Create a budget and don't budge from it. It is the anchor in this spending world. Always stay on top of it. When you go to the store you should always know how much money is in your bank account beforehand and you should always know what your spending limit is for every trip you make to the store. A budget is designed to keep you financially focused. If you don't have a budget, start one today! Secondly, remember your needs above your wants. If you have children, remember that they need food and clothes before you need a 100th pair of shoes or a fancier version of something you already have. If it is not a necessity then it can wait. Thirdly, and lastly, practice self-control. It is possible for you to be surrounded by thousands of people who over spend on a daily basis and still be the one who says, “I am on a budget. I don’t need these things right now.” It is a hard thing to practice. I know from experience what it is like, from being an everyday spender in my late teens and early young adult age, and then suddenly changing to be an everyday “saver”. It is hard but it can be done. Look for motivation in family and friends. Tell them that you really want to be more financially focused and they will support you. Becoming financially focused will bring changes for the better! And you will see a great difference in how much money you have left over each month! It is a wonderful feeling! What are some ways that use to stay #financiallyfocused?